Editorial - Sports, stop whining! Cape Hatteras in North Carolina has become a center for recreatinal angling in the last decade or so. The miles of once-undisturbed beaches are, as Ms. Nolan points out, often clogged with so-called sport utility vehicles ferrying anglers in search of bluefish, channel bass, or several other species. Unfortunately, the species in high demand by the sporetsfishermen are the same species in demand by U.S. consumers, predictably leading to competition between the fishermen fishing for their own enjoyment and those fishing to supply consumer demand. Considering the dollars that sportsfishing brings to Hatteras and Ocracoke Islands - and brings it in the spring and fall seasons when tourism is lagging - it's much to Ms. Nolan's and The Island Breeze's credit that she is willing to confront what many are beginning to see as a growing problem; the idea of some sportsfishing interests that our waters should be their own exclusive playgrounds. For a NJ FishNet that covers similar territory. We were standing around in the yard recently talking with a neighbor, whit owns a house across the street and visits Hatteras for about a month each spring and fall. He was bemoaning the sorry state of surf fishing, one of his favorite topics. "It's those nets, you know," he said, referring to commercial fishermen who fish nets from their heats just off the beach, in plain sight of hordes of recreational anglers. "Maybe they'll all go belly up," he continued, "and then in a few years, we will catch fish again." And that's the way too many recreational anglers feel about any day that they don't catch fish—or even don't catch as many fish as they think they should. They say it's the fault of those commercial folks— greedy people who would catch every last fish in the sea if they could. They are wrong, and they are being just plain unfair to commercial fishermen. Recreational anglers need to quit their whining, accept some responsibility for the problem, and work with commercial fishermen and regulators to conserve resources while solving the dilemma of who gets what. Talk to any angler who has been surf fishing on Hatteras or Ocracoke for 20 or 30 or even 40 years and you can hear the stories. Those were the days, they say. The fish just ate up the beach and jumped on their hooks. Any day, you could go out to the beach or out in a boat and catch all the fish you wanted in no time at all. My husband has a colleague who is fond of remembering "the good old days" when six guys could charter a boat out of Oregon Inlet and return to the dock with 20 tuna each. Did each of those six guys really need 20 tuna each? That's a total of 120 fish. Yet these gentlemen see no connection between the number of fish they—and other recreational anglers took—and depleted stocks. Now, we have a group of recreational fishermen who have an effort underway to have Eve species of fish declared gamefish—and thereby make them off limits to commercial fishermen. The fish are the red drum, the spotted sea trout, cobia, false albacore, and striped bass. 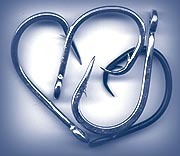 The organizers of this effort de-clared that the five fish are far more valuable to the state and coastal economy as sport fish than as a commercial catch. Therefore, they reason, these five fish should become the exclusive property of sportfishermen. They reportedly have a petition drive underway to gain support for their movement. Well, it is probably true that fishing most of the time isn't what it once was for recreational anglers. However, the same is true for commercial fishermen. Well informed people know that the resources of our oceans need careful and thoughtful management and that some Ash stocks need protection. But well informed people also know that the problem cannot be laid exclusively at the feet of commercial fishermen. First, there is the fact that there are many, many more recreational anglers on the Outer Banks than there were 30—or even 20—years ago. Back in the 1960's or the 197t)'s, vehicles were not parked three deep at Cape Point during a run of red drum. Now, in the spring and fall, that is a common sight. Fishermen are elbow to elbow when the fish are running. Even if all these anglers were competing for the same number of fish, it stands to reason that each would catch fewer of them. Next, let's look at water quality. Increased development along the coast and ill the towns that line the rivers that empty into the coastal waters and the rise in large farms and hog farms have all contributed to the increase in pollutants that damage water quality and adversely affect fish stocks. Consider all of the recent publicity about Pfiesteria, a microor-ganism that is presumed to have been around for a long time in our water hut can turn deadly, scientists believe, when fed by an excess of nutrients in the water. In this decade, Pfiesteria has killed thousands and thousands of fish in the Neuse and Pamlico rivers. After the declining quality of our water, we can look at loss of habitat. Coastal development has resulted in the loss of thousands of acres of wetlands that are crucial nurseries for fish and shellfish. And, last but not least, consider the impact of recreational fishermen themselves on fish stocks. In North Carolina and other states, recreational fishermen harvest far more of some species of fish than do commercial fishermen. This is true in North Carolina of some of the most prized species of fish, including red drum, dolphin, and yellowfin tuna. Recreational anglers are also harvesting almost as many speckled trout, Spanish mackerel, and king mackerel as the commercial industry. In his 1994 book "Wetland Riders," Robert Fritchey wrote: "The reluctance of the individual sport fisherman to acknowledge that he himself impacts fishery populations currently represents the single greatest threat to the long-term wcifare of the redfish (red drum) and speckled trout." "Wetland Riders" is Fritchey's fascinating account of the battle between commercial fishermen and the sportfishing in-dustry, which wanted gamefish status for several species in Louisiana. "The recreational fishing industry is extremely powerful," Fritchey writes. "Members of this industry do not sell fish for money; instead they market an incredible variety of goods and services to sport fishermen, who catch the fish for fun. Allowing commercial fishermen to harvest fish for the public to eat, rather than being caught by increasing numbers of sport fishermen, is viewed by members of this tourist-based industry as a restraint on its growth." With money generated by the industry and sport fishermen themselves, Fritchey writes, and under the banner of "conservation," the sportfishing industry is "convincing politicians to simply take the fish away from commercial fisher-men. Fritchey allows that the "typical sportsman is well intentioned and is concerned for the long-term vigor of fishery popula-tions" for himself and for his children. The reason, Fritchey says, other than the tendency to believe what we want to . believe, is that the sport fishermen is "simply not told otherwise. " To bolster his argument that sports anglers need to fess up to their own impact on fish stocks, Fritchey cites the case of the striped bass—or rockfish—on the East Coast. When striped bass populations fell dramatically, a number of states, including Maryland, shut down the fishery to both commercial and recreational fishermen. In 1990, Maryland re-opened the Chesapeake Bay, a major spawning ground, to striped bass fishing. Over the strident objections of the sport fishing industry, Fritchey says, the state divided the harvest evenly between commercial and recreational fishermen—each got 318,000 pounds. Maryland officials figure it would take five weeks of fishing for the recreational anglers to use up their quota. However, on the first weekend of the season, an estimated 80,000 sports fishermen turned out to catch the fish. The recreational fishery was shut down after just 10 days and even then the anglers had exceeded their limit by 20 percent. By contrast, at the end of their 30-day season, commercial fishermen had used up only about a third of their share of the fish. Interestingly, the result of this experience was that sport fishermen began lobbying to get the entire allotment of striped bass for themselves. Recreational anglers who want gamefish status for certain species or who are joyously awaiting the day when all the commercial folks "go belly up" are just as irresponsible and greedy as they accuse their commercial counterparts of being. One can't help but wonder what some of these recreational fishermen are thinking about. If sportfishermen manage to get five species of fish declared gamefish, then they would theoretically no longer be available to consumers in seafood markets and restaurants, which is unfair to those who can't or don't want to fish for their seafood. In practice, the fish would probably just be imported from elsewhere. and what does that accomplish? If recreational anglers manage to get all of this state's or this country's commercial fishermen regulated out of business, do they think that people in the USA will just stop eating seafood? Of course not! We'll just import more, probably from other countries that do not worry about regulations and saving the resource. So what will we have accomplished, other than to eliminate a very old and once respected occupation in this country. And, of course, to have provided more fish for recreational fishermen so they can buy more boats and gear and gas to catch more fish and make the sport fishing industry that much richer. The answer to the problem of course, is for commercial and recreational fishermen to work together for reasonable man-agement of the ocean's resources—at state, national, and international levels. The answer is not to give exclusive rights to any fish to any of the user groups. The ocean's resources belong to all of the people. According to the figures compiled by the North Carolina Division of Marine Fisheries, 1.14 million fishermen caught a total of 15.5 million fish in 1996. More than half—about 8.8 million fish—were released. The rest, 16 million pounds, were harvested—or killed. The division has been keeping statistics on recreational fishing on the state level since the late 1980's. The information is collected through telephone surveys and interviews of anglers at access sites. These statistics since 1989 provide some interesting information. The estimated total number of recreational anglers in the eight years from 1989-1996 has fluctuated from a low of 1.1 million in 1991 to almost 1.5 million in 1994. Overall, the numbers have remained fairly steady. However, the estimated number of fishing trips taken by these anglers has shown an increase—from 3.8 million in 1989 to 4.6 million in 1996. The most dramatic increase was in estimated trips from charter boats, which went from 92,000 in 1989 to 243,000 in 1996. The estimated number of fish released by recreational fishermen has steadily increased from 5.2 million in 1989 to about 8.8 million in 1996. Doug Mumford, who is in charge of the recreational statistics for DMF, says he thinks the harvest has remained fairly steady because of increased numbers of fish released and because of increased regulations, such as those that limit the daily bag limit and minimum size of certain fish. This 1996 comparison of commercial and recreation harvest of certain fish species was compiled by the North Carolina Division of Marine Fisheries. The 1996 recreational numbers are down from 1995, which, according to marine fisheries statistician Doug Mumford, is probably because hurricanes Bertha and Fran last year not only closed down some coastal areas but kept many inland fishermen at home, cleaning up their own damaged property.